Scholarship and Awards Day at Belmont University in Nashville, Tennessee, April 11, 2018. 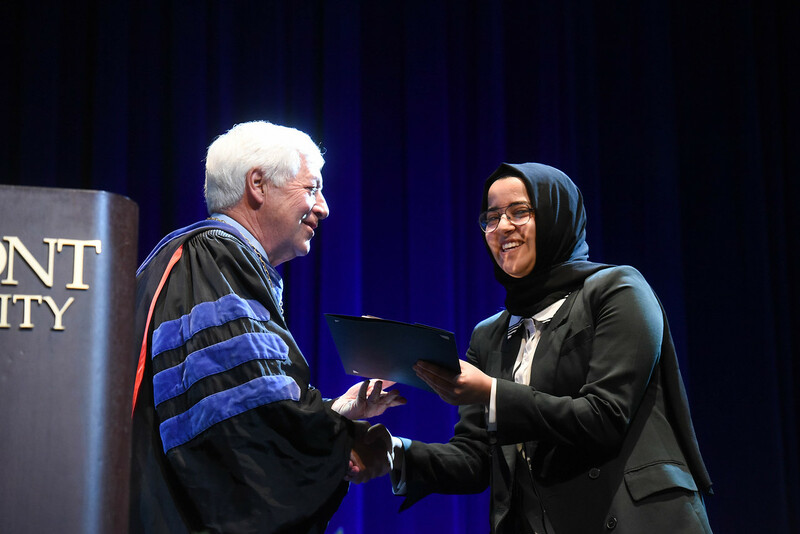 Recent Belmont University graduate and Brentwood, Tennessee resident Khadija Ali Amghaiab was recently awarded a Fulbright grant to Germany to partake in the English Teaching Assistantship (ETA) program there. The Fulbright U.S. Student Program is an international exchange program sponsored by the U.S. Department of State and the J. William Fulbright Foreign Scholarship Board that provides competitive grants to graduating seniors and graduate students to serve as cultural ambassadors of the United States abroad. Ali Amghaiab graduated in May with a double major in philosophy and German as well as a minor in political science. She was recently awarded Belmont’s Fourth Year Award for Leadership, one of the University’s highest honors. Ali Amghaiab previously did a Maymester study abroad trip through Belmont after her freshman year, and then spent a month last summer in Berlin studying at the Goethe-Institut. She’ll be living in Germany from this September through next June teaching English as part of Fulbright’s diversity placement (a subsection of the ETA program) at a middle or high school that is predominately made up of an immigrant/minority student population. Ali Amghaiab was also recently accepted to Harvard’s Divinity School to pursue a Master’s of Theological Studies upon her return from Germany in the fall of 2019. While uncertain exactly what lies ahead on her career path, she’s contemplating a PhD program as well as dedicating her future to education as her own college experience impacted her intellectually and spiritually.